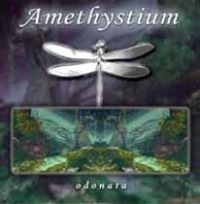 Amethystium is a project of the young Trondheim-based musician Øystein Ramfjord. His cinematic and highly atmospheric music is a fascinating blend of new age and more upbeat ethno-ambient styles. 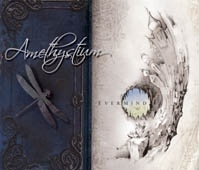 I think of Amethystium as a studio-project/solo-project of mine, occasionally involving other people. I don’t consider it my personal artist-name, as I’d rather not personalize it much. In a way it serves partly as a way of musical expression without putting myself in the limelight. playing with others in groups, but eventually it just took over completely. I guess being a bit of a control freak has something to do with it. As I started Listening to some electronic based music, I began to get a better idea of what I wanted to do musically myself, and Amethystium grew out of that. The first songs that would later be released were completed in 1998, and the first demo was recorded in late 1999. The three albums you made until now are part of the so called “Dragonfly Trilogy”; what did you have in mind? Well, it’s nothing pretentious – and I didn’t set out to make a trilogy at all initially. It’s more a way of grouping them together in retrospect, feeling that they belong together, and then to start with blank sheets again. childhood in a sense, though I don’t mean that in a put down way. Can you explain some more on the difference of content & music of the three seperate cds. I find it a little bit difficult to talk about the albums like that, since there aren’t any strictly organized intellectual concepts with each album -they’re more somewhat spontaneous, emotional and mental journeys than anything else. “Aphelion” feels a lot darker and “heavier” for me, even a little claustrophobic at times. I guess this is much due to it triggering my states of mind when working on it, but I think it shines through in the music for other listeners as well. think it is characterized mostly by its relative eclecticism in the moods and sounds. I’ve read some reviewers criticizing it for being “too nice”, or not having any darkness in it, which I can understand if that’s how they perceive it, but I don’t feel that way about it myself. It might be less pronounced though. might be the one with the strongest “love it or hate it” factor, I don’t know. So far the feedback has been really good though. 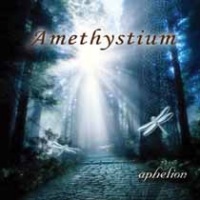 After “Aphelion” had been released a short while, you said that the third album would take a while; but nevertheless within one year it actually arrived. How come? I don’t quite remember when I said that, but “Aphelion” was finished in the late fall of 2002, while “Evermind” was finished in the early fall of 2004. So I spent almost two years with it, which is a good while. I don’t think I expected it to take much longer than that, although postponing it until 2005 was a very possible scenario in the later stages. It would have been the case if I hadn’t devoted the summer months completely to getting it ready in time. Can you perform your music live? No, I can’t perform the Amethystium material live, at least not without a lot of preparation. It’s not something I’ve given much serious thought to yet, but it would either require a big undertaking with the involvement of many musicians to play all the parts, or it would have to rely on extensive use of playback. playing live for an audience. How did you get in touch with the session-musicians which contribute to your albums ? What part do they play? Some were local, and some I heard about and got in touch with via the Internet. The biggest and most extensive contribution so far is definitely the vocals on three of the songs on “Evermind”, by vocalist Lee Nisbet of Animus Mundi. be worth checking out when it’s released. Which music or musicians have influenced you? It’s a bit hard to pinpoint overall, as my taste in music has been quite varied and eclectic over the years. There are some obvious artists I should mention though, the ones that first got me interested in using synthesizers as a main instrument, and who definitely influenced me when it comes to Amethystium. I think Vangelis was the first one I listened extensively to, though I also remember listening some to J.M. Jarre before that. Then I discovered Deep Forest, which was a big thing for me for quite some time, as well as Enigma. I would say that these are my biggest influences, though I’m probably influenced by music in other genres as well, in more subtle ways. Do you like to work with other (electronic) musicians sometime? What kind of instruments and recording techniques do you use? the occasional other instrument, like guitars and some percussion. The synth parts I usually record or program first in midi, and then record them down to digital audio on a PC running Sonar Producer. I make a basic mix along the way as I work on a song, and then I go back for the final mix towards the end. So, what’s next after “Evermind” ? What plans do you have for the future? I’ve started thinking about and working on a fourth album, though I don’t want to say anything about it yet – the “concept” is too wage yet, and all the ideas can still change. I’m very enthusiastic about it though!